After redesigning this website, the analytics show a 150% Increase in website visitors! The Log Jam Restaurant’s convenient location, hearty menu, and rustic appeal make it popular destination for locals and tourists alike. It had been years since their original website was created, and with more people now using smartphones and tablets to search for restaurants online, they needed a website to help their restaurant appeal to today’s tech-savvy consumer while maintaining the warm, family-friendly, Adirondack vibe of their brand. 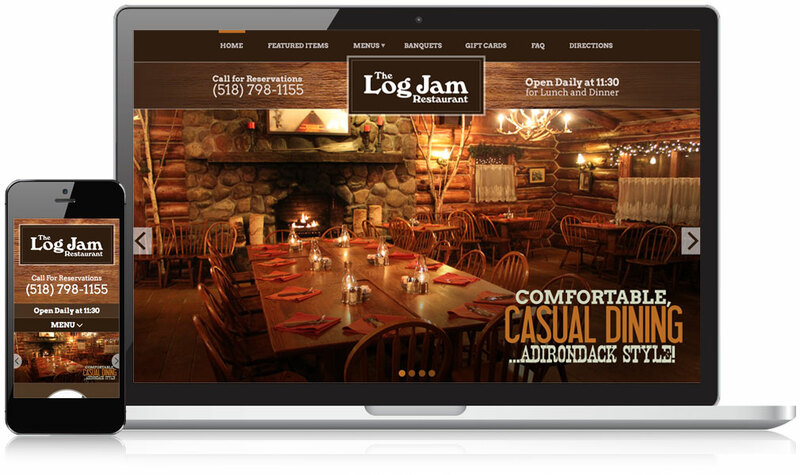 The new website for the Log Jam uses a deep brown color scheme and interior photos to reflect the restaurant’s warm, rustic, cabin-like atmosphere. To help capture visitors’ attention and encourage them to take action, orange call-to-action buttons are featured across the site along with the phone number and hours of operation. Built with responsive design, the Log Jam’s new website allows them to engage mobile users who want to explore the restaurant’s menus, get directions, or call for reservations directly from their tablet or smartphone device. 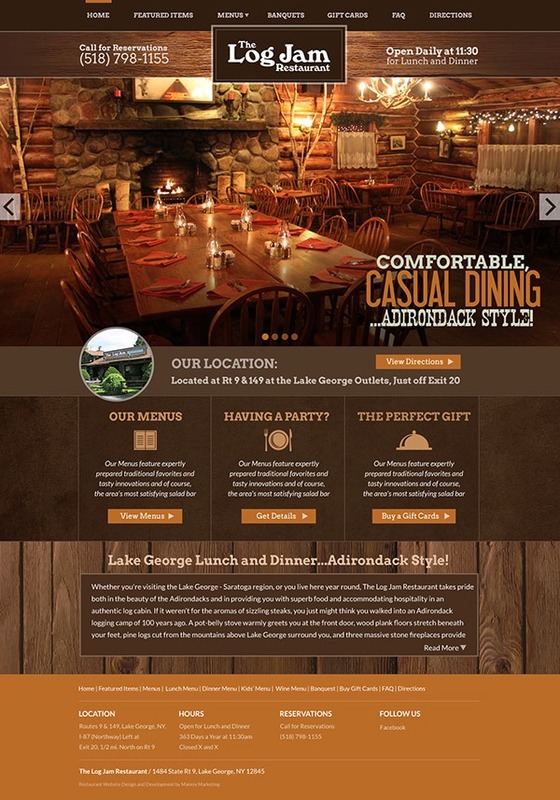 Compared to the existing website, the new responsive website for this Lake George restaurant attracts a higher percentage of tablet and smartphone users, as nearly 1 in every 2 people who visit the new site are using a mobile device. A listing of the restaurant’s menus allows visitors to browse the Log Jam’s hearty dishes and check out the lunch, dinner, drinks, and kids menus. By developing the Log Jam’s new website on the user-friendly WordPress Content Management System, it’s easier for the restaurant to upload their latest menus to the website and be sure that potential customers are viewing the most current options, specials, and prices.